NEW CASTLE – On a cool spring evening, a small group of men and women are hunting for plastic eggs filled with treasures in a side yard. They look under bushes and in clumps of new green grass for the ultimate prize, the golden eggs. They welcome the spring season with a focus on rebirth and new beginnings. In short, Wicca is a modern take on the ancient pagan religion. It has historically involved witchcraft and magic, but that doesn’t mean those characteristics are required in a Wiccan’s personal practice. And not all Wiccans call themselves witches. But this group, called the Enlightened Circle, doesn’t mind. (a motorcycle shop/clothing store/bookstore) caught her eye. The shop, which started in New Castle in June 2012 and has since relocated to downtown Glenwood Springs, offers pin-up- and rockabilly-style clothing, workshops on Wicca, metaphysical supplies, jewelry and more. Self-described as a solitaire – which is practicing Wicca alone as opposed to a group or coven – Herwick had mostly been conceptualizing her faith on her own. She was happy to meet The Biker and The Witch owners Donnie Gonzales and Kristin West. The couples’ store at 918 Grand Ave. (Suite C) hosts Witch’s Night monthly for those interested in pagan practices. West said she first became interested in Wicca right after high school and has been practicing for 17 years since. West and Gonzales said they run the only metaphysical shop in the mountains. “I wanted a place where pagans can get together and kind of feel safe,” West said. The venue was a welcome sight for many of the believers of the metaphysical in the Roaring Fork Valley. 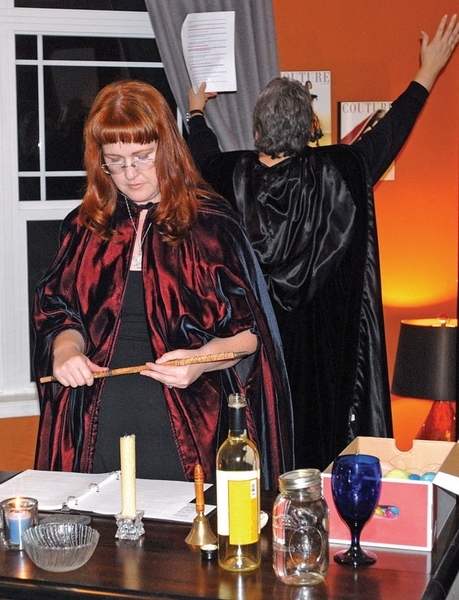 Reynolds and Herwick spoke of the many misconceptions that surround Wicca. Herwick agreed that society, history and Hollywood have done a fine job of portraying witches as evil or bad, but that is not the case in her practice. But not all Wiccans follow or believe in a god or goddess, Reynolds said. The Enlightened Circle group has grown from around nine members to close to 20. They meet about twice a month, whether it’s through The Biker and The Witch’s Wiccan workshops or seasonal get-togethers, like the spring ritual in March that involved a ceremony and egg hunt. During the Ostara coven ritual, a few of the witches donned capes and hats. Twenty-two-year-old Kaitlyn Kennedy, originally of Colorado Springs, arrived at the springtime ritual with pink tulips. She has been practicing for a few months and became interested in Wicca as a teen. Kennedy said she recently came out of the broom closet to her parents. Matt Moore, 35, is a shaman from New Castle who has been attending the Enlightened Circle get-togethers. He was influenced by a family member. Moore began studying different aspects of shamanism, which is the study of altered states of consciousness to encounter and interact with the spirit world, 17 years ago. The Enlightened Circle doesn’t consider itself a fully-organized coven, but it is a group interested in representing itself in the community so more people understand Wicca. The members aspire to have a float in the Strawberry Days parade and participate in community events such as trash pick-ups and workshops throughout the year.